Ever heard of a license plate that cost more than a car itself? Look no further after one passionate Texas A&M fan paid $115,000 in an online auction for the rights to have a Texas vanity plate displaying the popular Aggie phrase "12THMAN" on the front and back of his car. Tony Buzbee, the winner of the coveted plates, will be presented with them during the second quarter at Saturday’s Texas A&M-Alabama game in College Station. 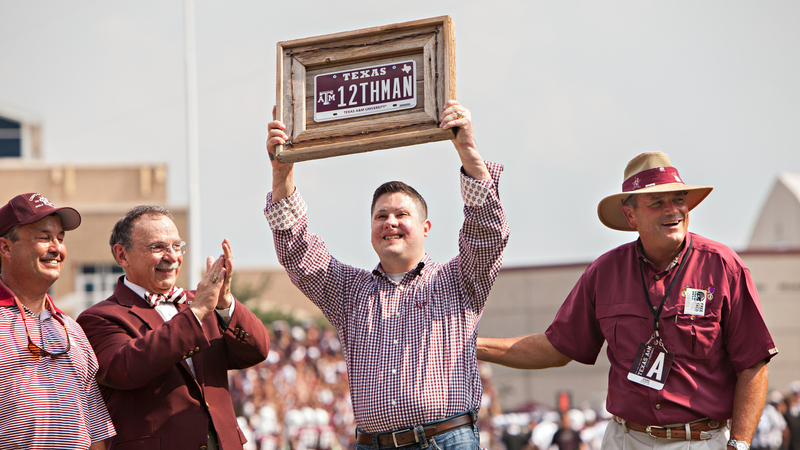 Buzbee won’t be sporting "12THMAN" on his vehicle, the Houston attorney and former U.S. Marine Corps officer said he plans to give the license plates to a decorated war veteran who graduated from Texas A&M, whose identity he has yet to reveal. "I’m not saying who it is yet, but I see him as a 12th Man to our country," Buzbee told ESPN. "He did a lot more than pay a hundred thousand dollars for a license plate." Proceeds from the auction will benefit Texas A&M University and the General Revenue Fund of Texas. The veteran who will receive the plates from Buzbee will get the rights to the plates for 10 years and also will have first rights to renew when the period ends.